If you have a dog, you probably have one or more dog gates. Unless, like me, you have a dog that can jump higher than you are tall. Never fear, however, as there are still some ways to keep your Olympic-high-jump-qualifying pooch out of trouble. Dog gates and other barriers are necessary for most dog owners. They can block off unsafe areas, like dangerous stairways, kitchens with stoves in paw-reach, baby rooms, or rooms with lots of electronics. Some dog owners use gates during housetraining to contain accidents. However, different dogs have different abilities, and what might keep one dog out might be easy to hop over for another pooch. First off, get the idea of a “dog specific” gate out of your head. 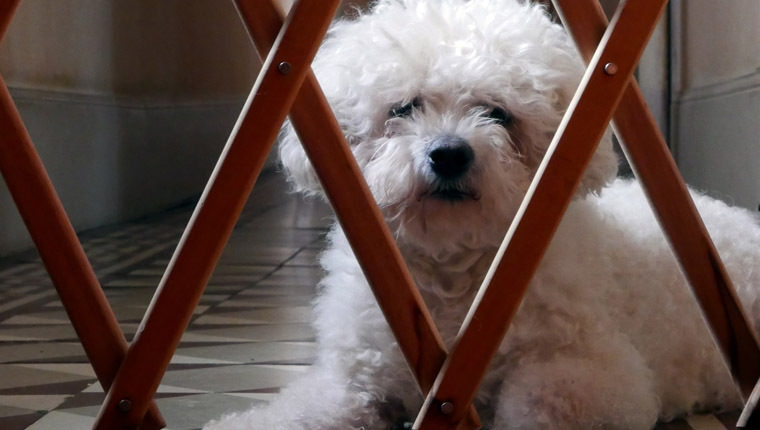 Often the best option to go with for a doggy barrier is, in fact, a baby gate. Since these are our fur babies we’re talking about, a baby gate is still perfectly appropriate. Right? Next off, it’s best to ask a few questions to determine just what kind of barrier is right for you and your dog. Have you already adopted your dog and brought them home? If so, how big are they? How big will they get? Are they a jumper? A scratcher? Will keeping them relegated to a certain place in the house make any separation anxiety they might have worse? Also, where do you live? Is this gate going to be for a house? An apartment? Are you going to need more than one? You’re probably going to need more than one. 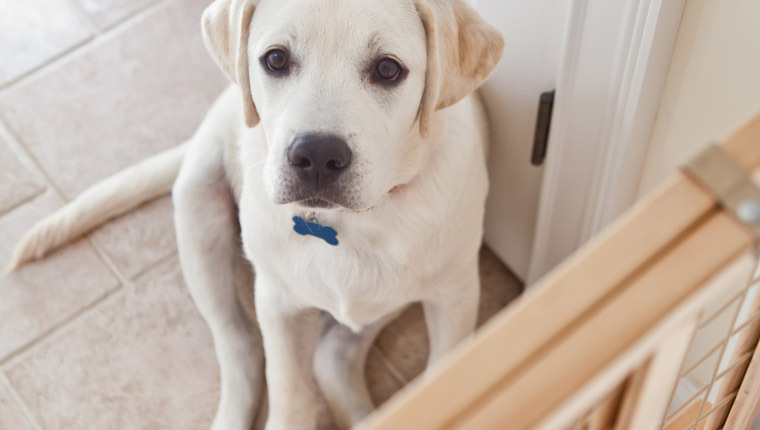 Most importantly, are you using a dog gate to avoid having to properly train your dog around certain areas of the house? It’s one thing if your dog is still potty training, but if this is a permanent solution to a fixable problem, you should really consider other alternatives. If you already have your dog, you hopefully know how much bigger they’re going to get. If you’ve adopted a mixed-breed dog and have no idea how big they’ll be, don’t feel too bad about this. Just prepare to upgrade in the next few years if your dog grows larger. Ideally, you’ve asked yourself the questions above and have some answers. You should have a sense of what size gate you need, how strong it needs to be, and how many you should have. Make sure that the gates you purchase are high enough and wide enough to fit their respective spaces. Some gates work for large, open spaces, rather than just average doorways. They tend to be more expensive, but they’re better than the alternative. Gates that don’t fit properly can be tripping hazards or damage the walls of your house. Some gates can be used outside–around swimming pools or gardens, for example. If you need a gate for temporary use, like for housetraining, a freestanding gate may suit your needs. They’re easier to put up and take down and will generally not damage your house. There are also dog gates for stairs and gates that have smaller openings for animals such as cats. As always, do your research before making this purchase. Here are a few things to keep in mind. Mounting. Gates are either hardware-mounted or pressure-mounted. Hardware-mounted gates permanently attach to doorways, requiring a drill and hardware for installation. They’re sturdier than pressure-mounted gates, and large dogs won’t knock them over. Pressure-mounted gates don’t use hardware, are easy to install, and can move whenever you like. You don’t need to put holes in the wall to use them, so they may suit renters who can’t make permanent alterations to the home. You can even take one along with your dog on visits, say to block off Aunt Sally’s kitchen because she doesn’t allow dogs in her living room. Features. Some walk-through gates have doors that are handy, but not very wide. Some gates block dogs but have tiny doors for cats. Gates can be made of wood, metal, or plastic, and some are designed with home décor in mind. Electronic gates open via a wall-mounted button by remote-control, like the garage door. Freestanding gates cover fireplaces. Some new gates designed for children have alarms. Size. Gates vary in height. If you have a large, bouncy dog, like an Irish Setter, they can easily jump over a short gate. A Yorkshire Terrier, on the other hand, isn’t likely to hop over a 29-inch-high gate. And please, read instructions for installing and using your gate carefully. Remember that a dog can knock over an incorrectly installed gate and get hurt or scared when it falls. If you’d rather not use a dog gate, the best alternative is always training. This will obviously be more labor intensive, but also more rewarding. It’s vital that your pet learn boundaries of all sorts. A more literal one isn’t an unacceptable demand to place on our pets, so long as it doesn’t isolate them from the other members of the house. This is also the most humane way to teach a dog that there are areas of the home where they’re not allowed. While some methods offer techniques that are based on unpleasant smells or making your pet uncomfortable enough to not want to enter the room, I do not recommend this. It is never ideal to make your dog feel uncomfortable. This could present issues down the road. I’ve managed to train dogs I have had in the past about their boundaries, and it’s always better this way. It will take time and patience, but dogs almost appreciate your care and attention regardless. They are, of course, still worth the effort, and time spent training is time spent bonding. Do you have any dog gate recommendations? Have you managed to train a dog to not enter certain rooms? Let us know in the comments below!